it's national truffle day! FINALLY a day i can get on board with. aside from the obvious of celebrating by stuffing my face with endless LINDOR truffles, i thought it would be nice to bake them into something too! 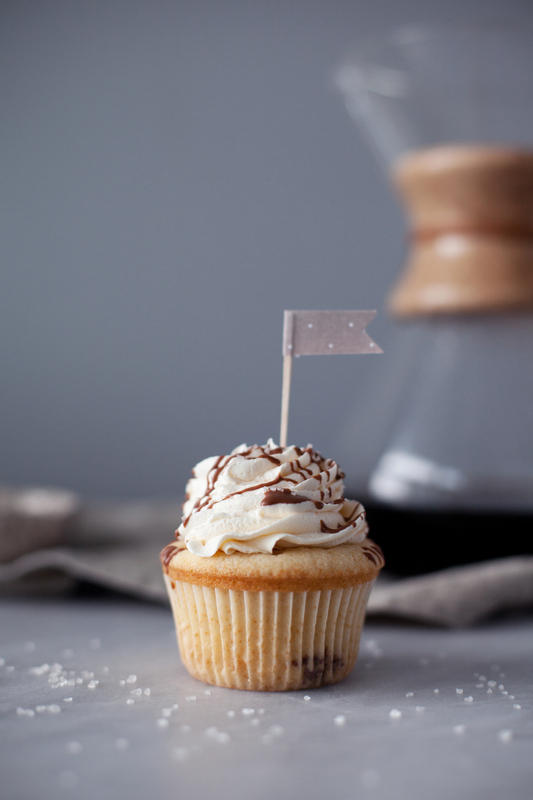 a salted vanilla cupcake, stuffed with a surprise milk chocolate LINDOR truffle. if a surprise gooey chocolate truffle isn't enough, i finished them off with a drizzle of truffle ganache & a sprinkle of sea salt. i know my sister in alberta is beyond jealous looking at this right now, because these are one of her favourite chocolates too. good thing it's her birthday this week & she will be flying home.. should i be a nice sister & save her one!? when i worked downtown, there was a LINDOR store in the concourse of my office building. they had piles & piles of different flavours of truffles i didn't even know existed! i was like a kid in a candy store. what is your favourite flavour of truffles?! in the bowl of a stand mixer cream the butter and sugar. add the egg & vanilla extract, beat until light and fluffy. in a separate bowl sift the flour, baking powder, and salt. gradually add it to stand mixer at low speed, alternating with the milk. divide the batter evenly amongst 12 lined cupcake tins. 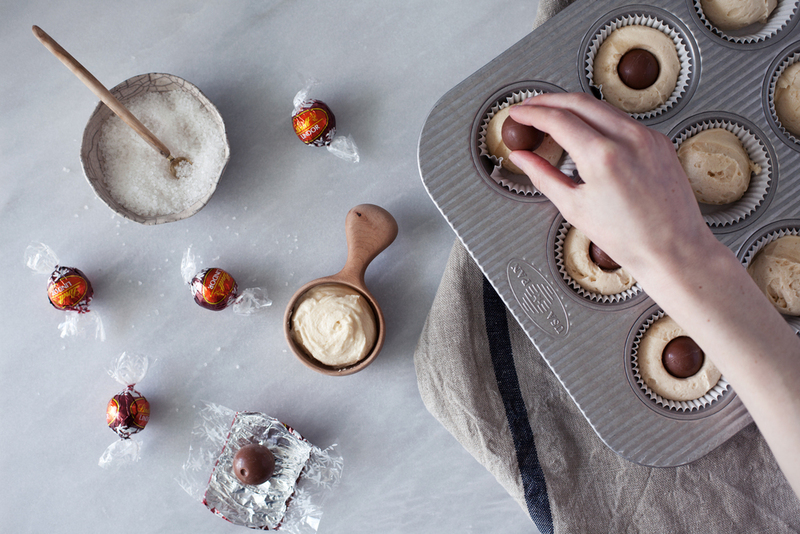 place a whole LINDOR truffle in the centre of each cupcake & push down. for the buttercream add the butter, sugar, vanilla & salt to the bowl of a stand mixer. beat until frosting is light & fluffy, about 8 minutes. while the buttercream is whipping make the chocolate ganache. melt truffles in a microwave safe bowl. Add cream & stir until silky smooth. let cool slightly. pipe each cupcake as desired. drizzle with truffle ganache & a sprinkle of coarse salt. this post was created in partnership with lindt chocolate. happy national truffle day!